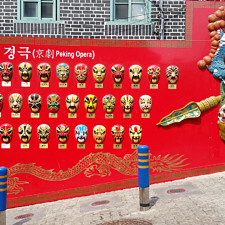 Before making our way to the Palace, we walked to Tongin Shijang (통인시장 – Tongin Market), an old-style marketplace that sells food and souvenirs. They have a fun and quirky system where consumers use old coins to make purchases. 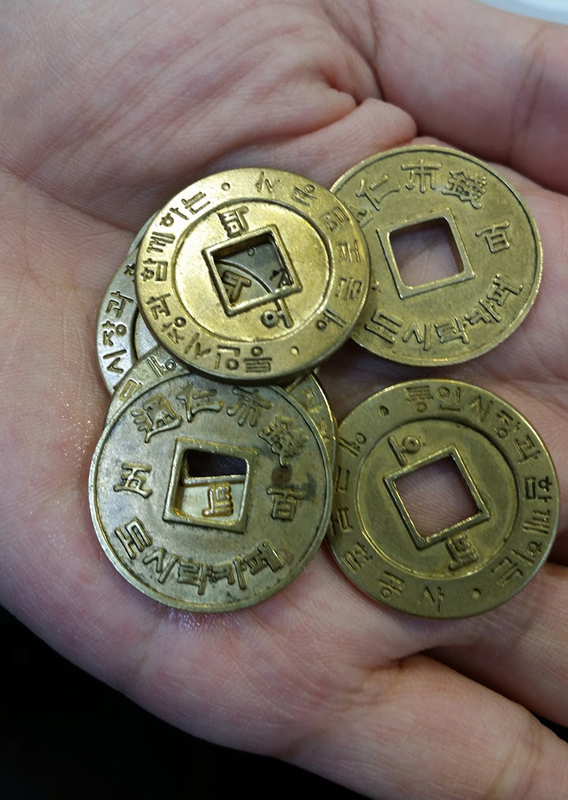 You trade in some Korean currency, and the marketplace gives you coins to use for their dosirak (도시락 – lunch box). You can also use their coins for other kinds of snack food, but we decided to not use their coin system and just buy our light lunch with regular currency. Here is the marketplace! Each store is set up like little kiosks or stands. These are the coins that we’re supposed to use when purchasing lunch box items. 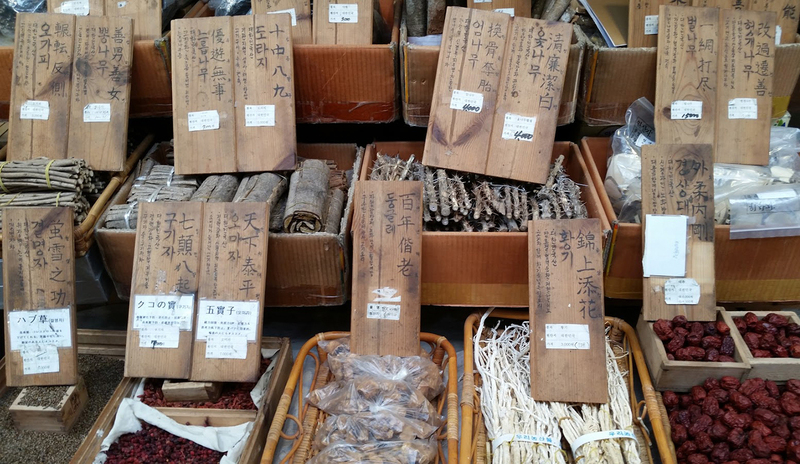 A display of a vendor’s goods: dried vegetables, fruit, and bark. 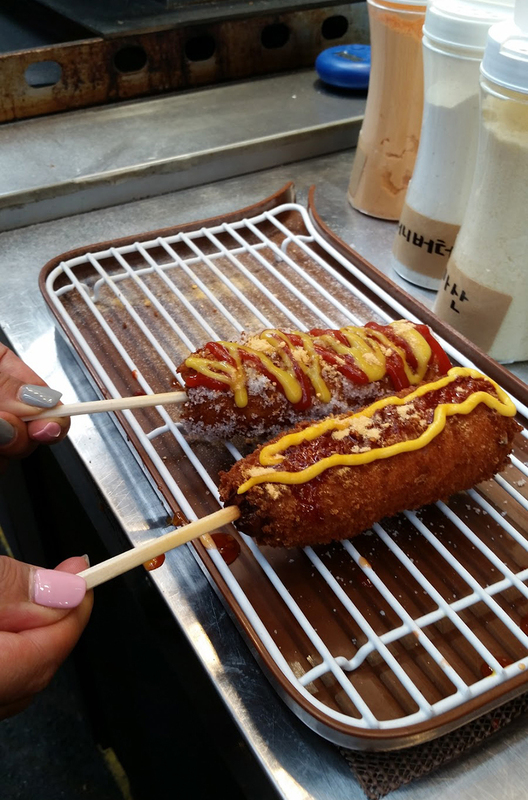 One of the many food stands inside the marketplace: this one is selling grilled and fried food-on-a-stick. 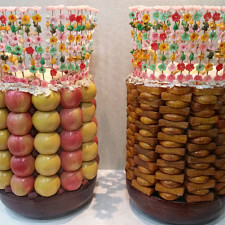 This is Grandma’s Fried Rice Cakes (할머니 기름떡볶이). 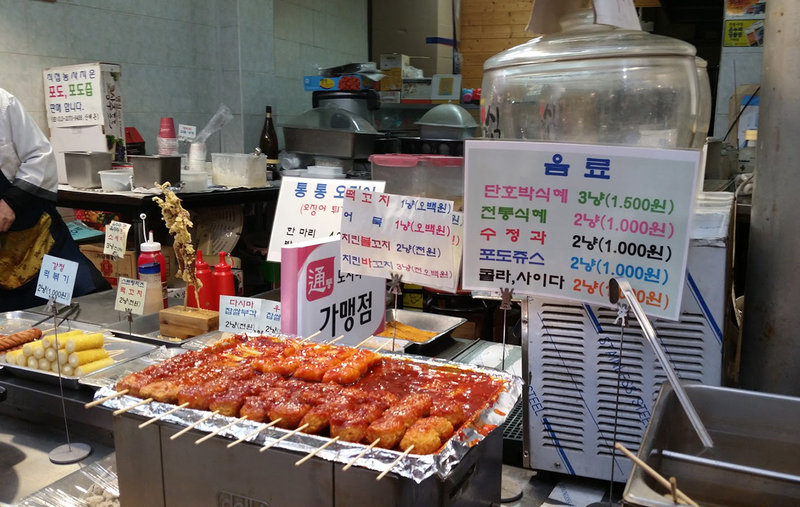 It’s Tteokbokki, but a fried version, so there isn’t much sauce. 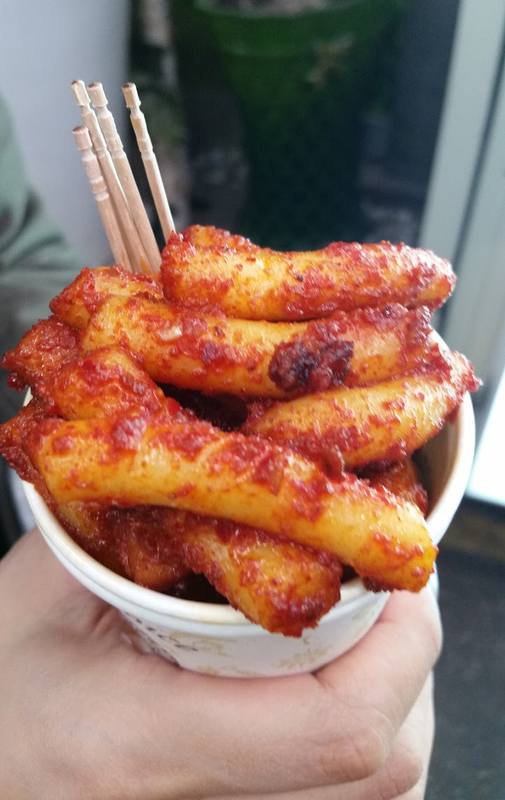 Here is a cup full of (blurry) spicy fried rice cakes! 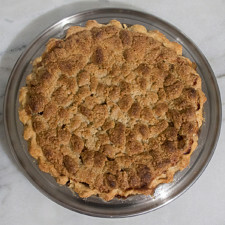 Hot, chewy, and delicious! 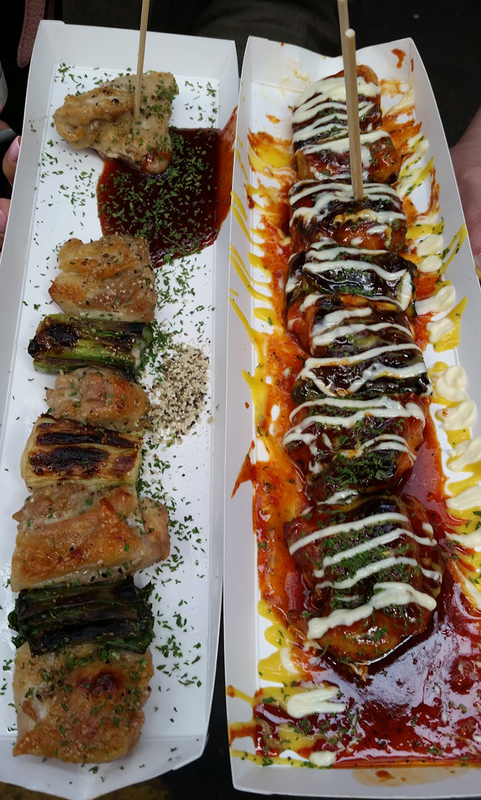 We also picked up some grilled meat and vegetables, drowned in sauce! Kitty and I ate hot dogs. 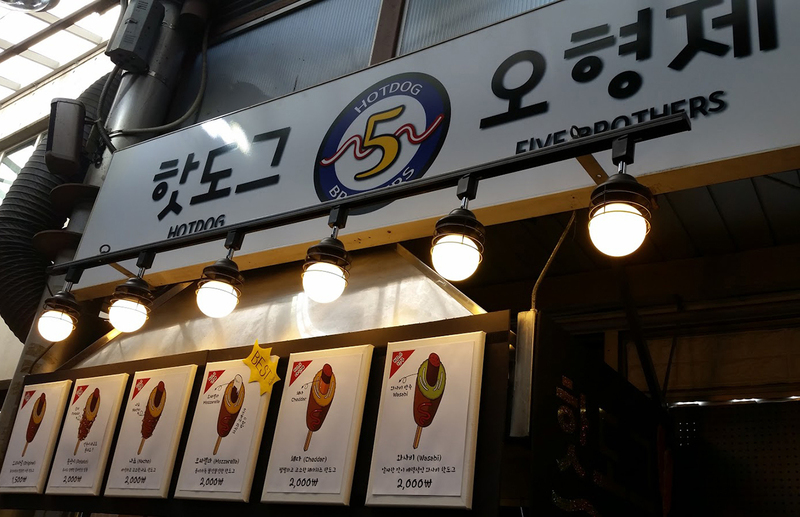 They had a choice of five different kinds. My cousin is helping us put sauces and toppings on our hot dogs! We got the cheddar and mozzarella. 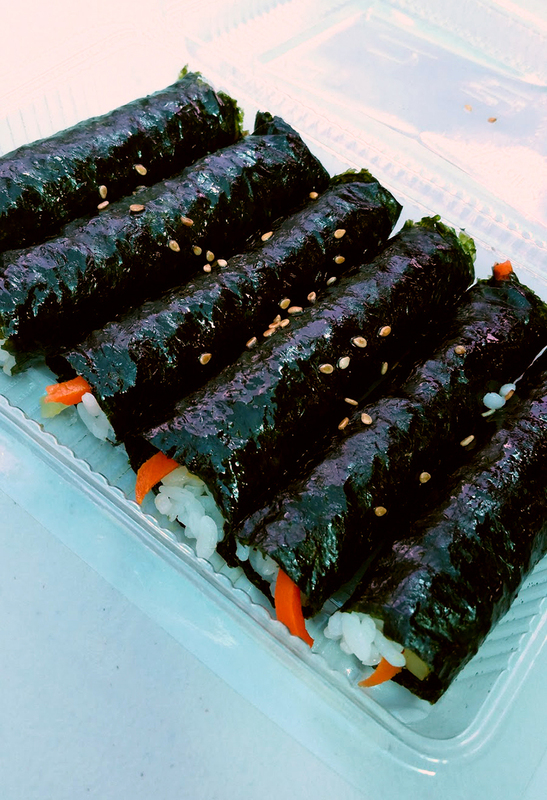 We couldn’t leave without eating the small rolled Gimbap. It looks a little blue, but that’s due to a blue canopy that we were sitting under! 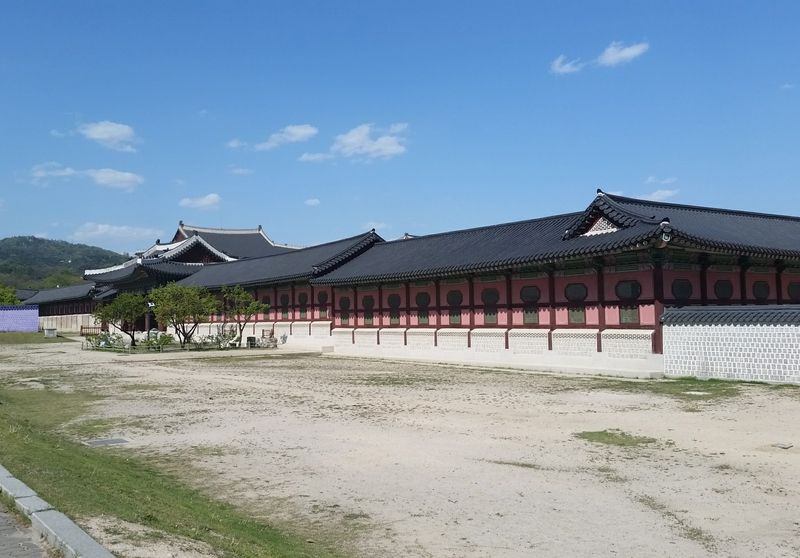 We went upstairs and sat down in a seating area, quickly ate our food, and made our way over to Gyeongbokgung. Being that it’s a full day of walking around and exploring, we felt we should be diligent. Now, I would have shared with all of you how the palace grounds were magical; the sky was blue, the sun was shining brightly, and the halls and living quarters were vividly painted in an array of bold colors. Sadly, it was a bit windy and the grounds were dry, so there was a lot of dust being picked up. All of us were sneezing after a half-hour, and decided to move away from the area. We didn’t get to see the two pavilions, which is a bit of a shame. It’s been a few months since we were there, and I’m still bummed that we didn’t see them. It’s definitely on the list of places to return when we go and visit again. However, the one lucky thing about going on this particular day was that we didn’t have to pay to get in! As we were walking in through the main gates, my cousin said that our entrance was free, due to it being the last Thursday of the month. The other way to get in for free was to dress up in a traditional outfit. 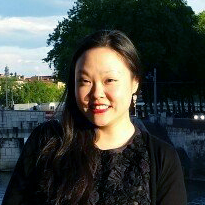 There are neighboring shops that allow you to rent an outfit for a small fee. Get all dressed up, and you can gain entry! 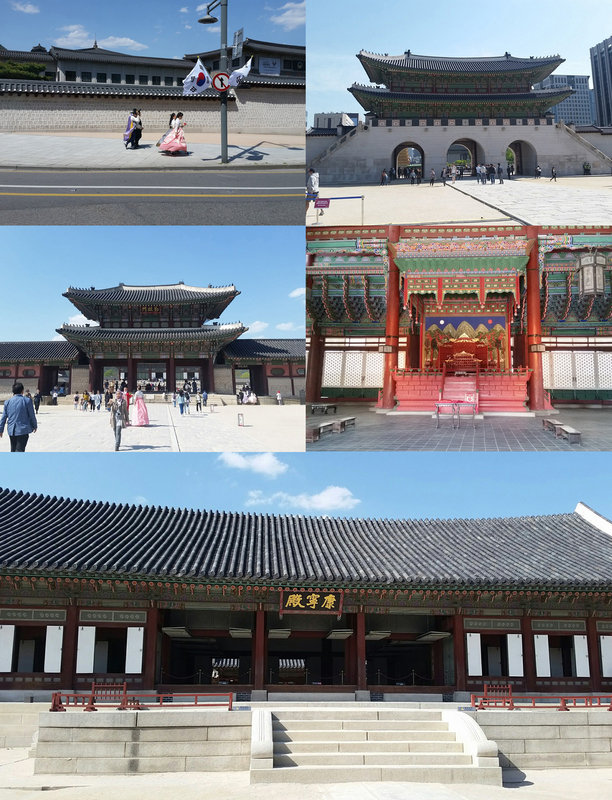 Small photos, clockwise, from top left: Young folks dressed up and walking along the stretch of the outer walls; the back side of Gwanghwamun (광화문), the main gate into Gyeongbokgung; Geunjeongjeon (근정전), The Throne Hall; Geunjeongmun (근정문), The Third Inner Gate. 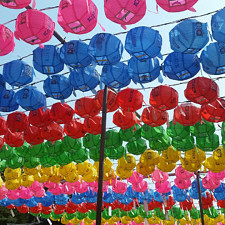 Bottom photo: Gangnyeongjeon (강녕전), The King’s Quarters. 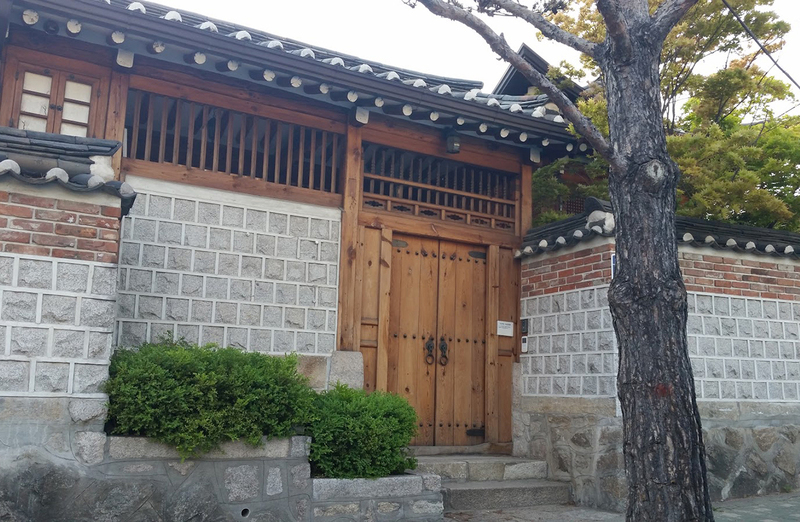 The entrance fee into the palace also gives you free access to the National Folk Museum of Korea (국립민속박물관) right next door! We didn’t visit the museum on this trip, but it’s on the list for when we go back. 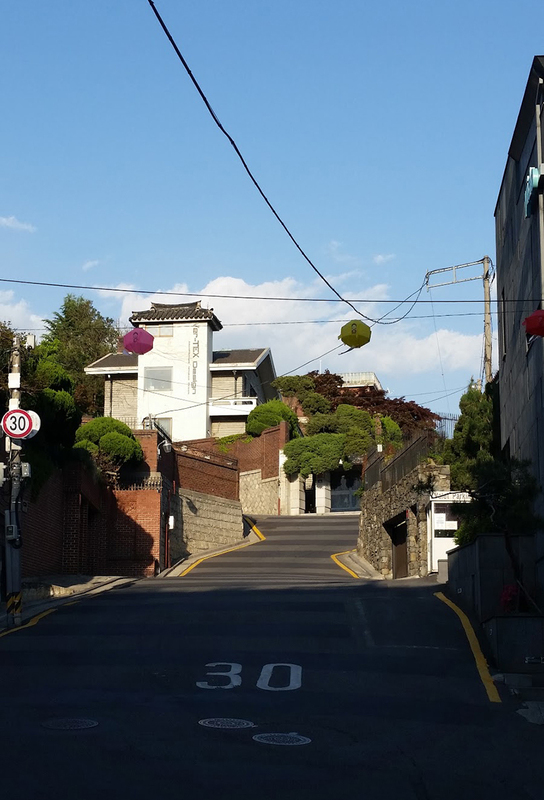 A brisk walk out of the palace led us to Bukchon Hanok Maeul (북촌한옥마을), a grouping of neighborhoods with houses built in the old style. We really enjoyed walking along the alleyways with all the beautiful houses! A sign leading up into the neighborhoods. 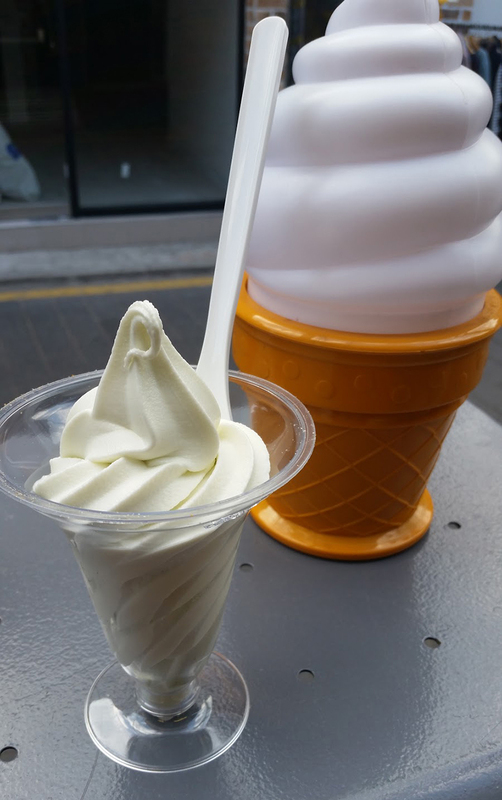 There was a stretch of shops at the base of the hill, and we decided to stop at a café to have some refreshing soft serve. This flavor is grape! Here we go up the hill! One of the many houses along the narrow streets. 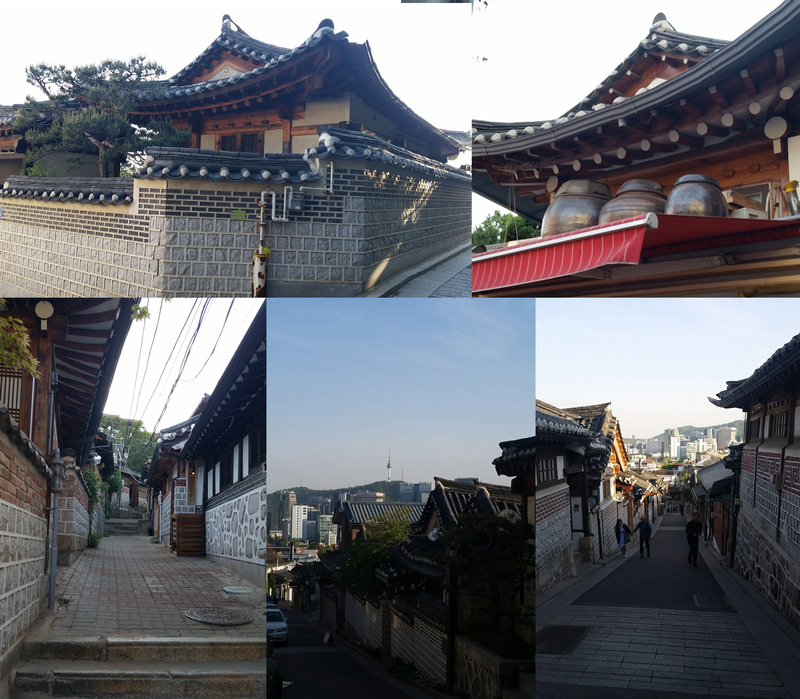 Clockwise, from top left: Old-style wall and roof; Balcony with hangari (항아리), earthenware jars; an alleyway; view of the N Seoul Tower (N서울타워), commonly known as Namsan Tower; a quiet walkway into a group of homes. It’s an area where the aristocrats would live, while working in the palace. I think it’s amazing that the area is still intact, with all of the old homes still built in reference to nature and its natural surroundings. 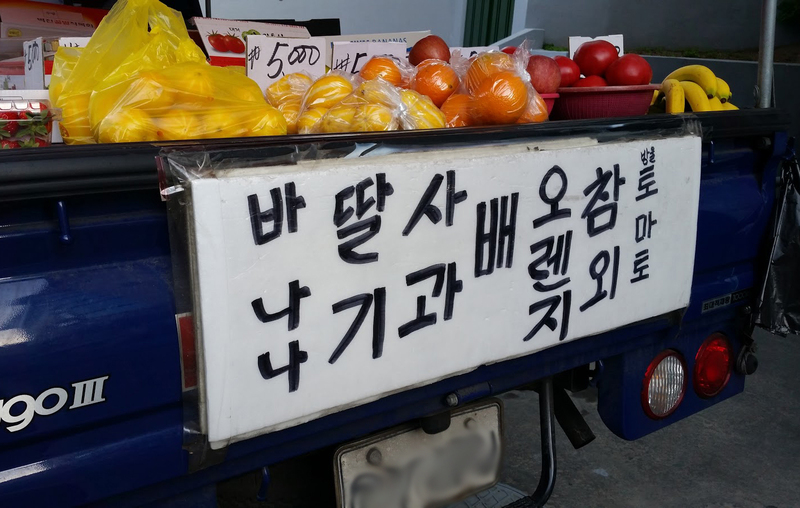 On our way down the hill, we spotted a fruit truck. We collectively thought it was cute, so we snapped a photo. 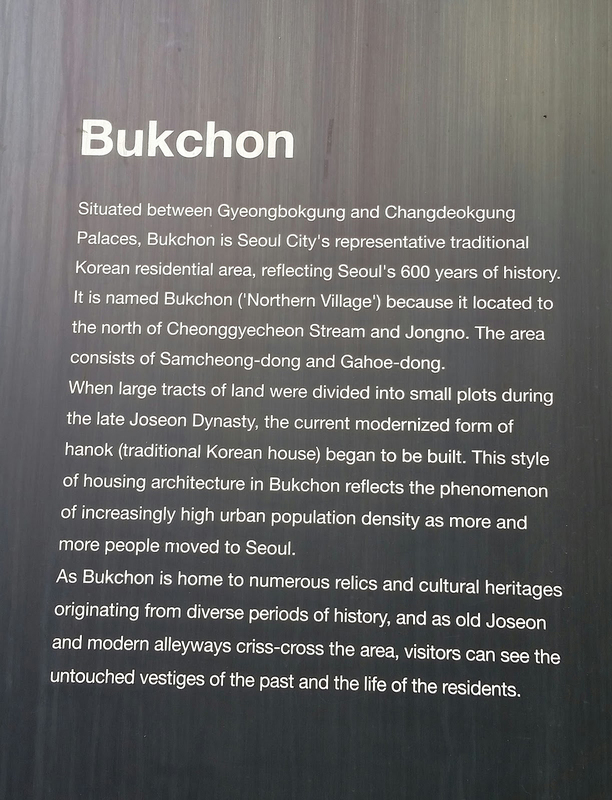 After making our way out of the Village, we walked just south of the palace grounds to Kyobo Bookstore near Gwanghwamun (교보문고 광화문점). 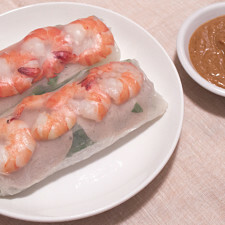 If you’ve been following along this entire series and also checking out some of my recipes, my most recent one is about making a rice cake, called Yaksik! This bookstore is where I picked up my cookbooks. 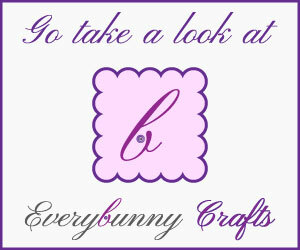 I’ll post a photo of my books really soon. This is where our day came to a close. 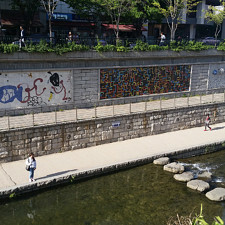 We went home and tried to get plenty of rest before setting out to the Rice Cake Museum (떡박물관) and Insadong (인사동). 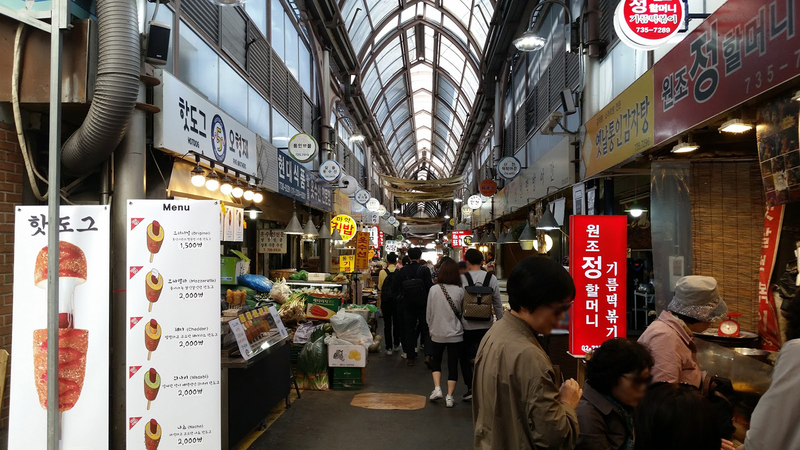 Tune in next time for more adventures in Seoul! 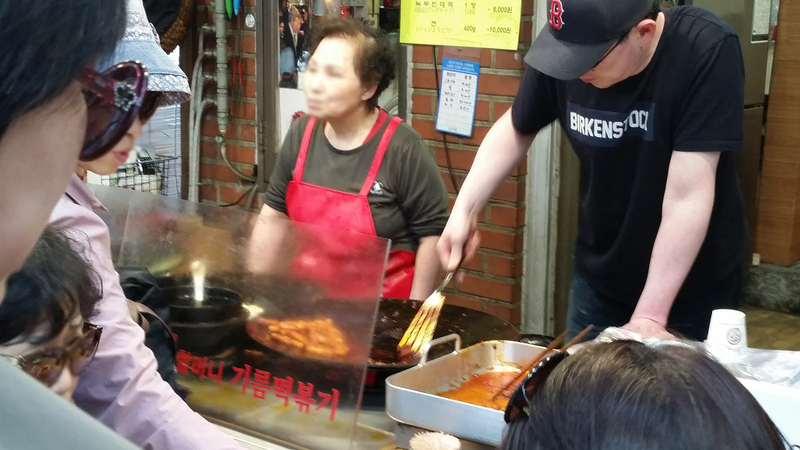 No thoughts on "Food Adventure in Korea – Our Second Week – Part Three."